There are many ways to lace waraji. Several traditional methods are illustrated. The main thing to keep in mind when lacing warji is functionality - if it holds it on your foot, then it's fine. 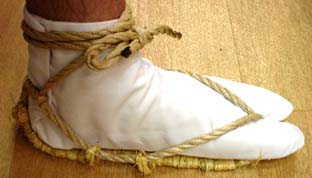 The most important thing is to wear your waraji with tabi (Japanese toe socks). This is especially important if you chose to consrtuct your warji from jute or some other non-straw substitute. 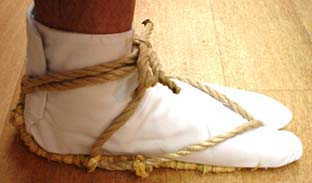 Regular socks do not provide enough padding on the bottom and the soles of your feet will become irritated from the rope after prolonged wear (3 or 4 hours). I can not say if this applies to srtaw sandals, as I do not yet own a pair, but I am planning to do my next pair from straw and will update then. Tabi are available commercially, mostly in white, although I have seen black and white with black toes. I have so far not seen any documentation for non-white tabi in period.